This page explains how you can collect STREAKS in OnlineNaira. Streaks are a great way to encourage yourself and your friends to come online daily to look after the business you are committed to building online. 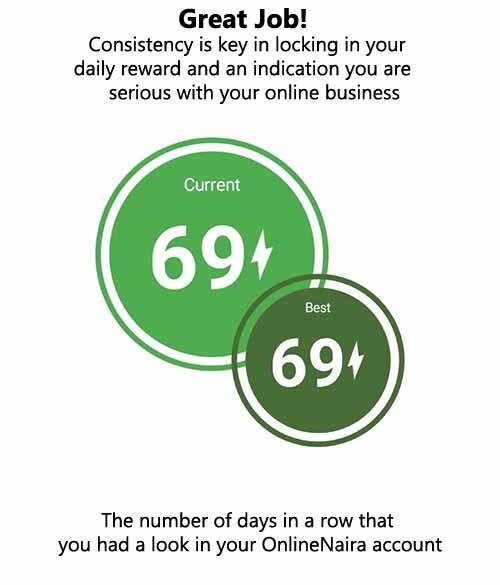 Collect Streaks, build your own confidence and see that you are making the best use of your online presence. The truth is that there is really no reward that is more valuable than encouraging yourself to keep coming online to build an income for yourself, but we have thrown in five (5) Naina for every streak that you collect. We expect you to login daily and consistently for 30 days after which you will be able to convert each Streak collected into Cash at the rate of N5 per streak. If you fail to login in any one day, you will lose the streaks you have collected and you will start from zero again. As soon as you have collected 30 Streaks or more, you will be able to convert your streak to Cash. To withdraw your money from OnlineNaira, you need to login, click on WITHDRAW MONEY and enter the amount you want to withdraw, choose a withdrawal method and submit. We are never late with withdrawals. Affiliates - refer your friends and family to OnlineNaira to earn money. Agents - resell all OnlineNaira products/services to earn money. InvestOn - invest in OnlineNaira in return for a monthly income (ROI - 50%). Cloud Mining - Invest in Cryptocurrency mining to ear daily returns. Current Streaks - Every time you collect a STREAK, your Current Streak count is increased by one. Best Streaks - This is the highest number of Streaks you ever collected.